Be amazed for the breathtaking Antelope Canyon and Horseshoe Bend in Page, AZ in a small, guided and personal tour. This is a one day trip to one of the most beautiful spots in the planet! This tour is for those that want to discover a fascinating, off-the-beaten-track gem that offers scenery and nature unlike any other location. 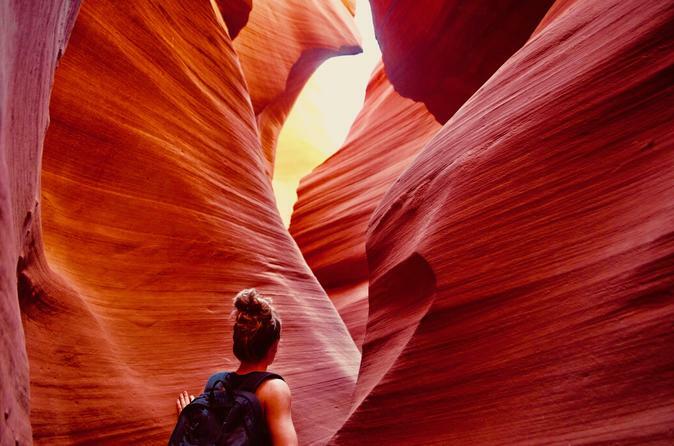 Antelope Canyon is one of the American Southwest's thesaurus and pretty well kept by Navajo Tribe, and it begs to be discovered by people just like you! People who loves to get stunned by mother nature. Avoid the crowded buses and make it personal and even more special! This will be a day to remember! Explore the mystery of Antelope Canyon and Horseshoe Bend in one full day trip! You'll be picked up from your hotel in Las Vegas between 6am and 7am in a comfy minivan or van and you'll get some goodies to fuel you up. Enjoy the scenic views on the way from Las Vegas to Antelope Canyon, crossing Utah and Arizona limits a couple of times during the way. Your first stop for stretching the legs can be either in Mesquite, NV or Virgin River Canyon - AZ. Than keep your eyes on the beauties during the way: Apple Valley - UT, Fredonia - AZ, Kanab - UT and The Grand Staircase Escalante Monument are in the beautiful way to Page - AZ where you might be arriving around 12pm. Than it's time for an approximate 1 hour and half tour through the Lower Antelope Canyon with a certified Navajo guide to see red sandstone walls with corkscrew formations, illuminated by sunlight coming down into the slots, which are simply breathtaking. This colorful canyon is famously long and narrow with a walkable corridor at the bottom of the canyon floor. It was formed by flash floods flowing into the cracks of the Navajo sandstone which was then eroded by wind. Daylight penetrating through the narrow opening at the top creates different kinds of reflected light and colors. Antelope is the most visited slot canyon in the Southwest, partly because it is easily accessible and by far the most publicized, and also since it is so gorgeous and stunning, with just the right combination of depth, width, length, rock color and ambient light that makes this area a popular location for photographers and tourists from all the world. After that it's time for lunch and than we head to Horseshoe Bend, just 10 minutes away. There is a 1 mile back and forth (1.6km) hike on a dirt trail, which is both uphill and downhill. After that you'll get close enough from the edge, if you can Lol - that is about 1,000 feet (305 meters) down - to a rock formation in the Colorado River. Horseshoe Bend is the top attraction in both the Lake Powell and Page-AZ areas. This awe-inspiring foray into one of nature's most visually striking offerings ends with hassle-free transportation back to your hotel. On the way back keep it up, you will probably get a view of a dramatic sunset on the comfort of your seat. You will arrive back into Las Vegas at approximately 9pm depending on traffic conditions, stops for stretching and restrooms. Join us and let's make friends!